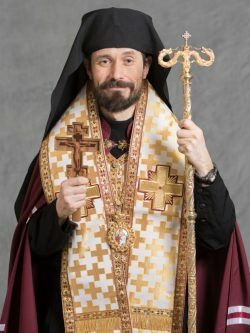 PARMA, Ohio (CNS) — At 44, Bishop Milan Lach is the fifth bishop of the Byzantine Ruthenian Eparchy of Parma and the youngest bishop to head a diocese in North America. He was enthroned recently as Parma’s bishop during a Divine Liturgy at the Cathedral of St. John the Baptist, after having served as its apostolic administrator since June 24, 2017. He succeeds Bishop John M. Kudrick, who resigned in May 2016.